Reporting from the Global Sources Mobile Electronics trade show in Hong Kong, Japanese language blog Mac Otakara on Thursday said each accessory maker it spoke with expects Apple to introduce a redesigned iPad Pro with USB-C connector this fall. Today's rumblings line up with recent rumors and analyst reports regarding a switch to USB-C. In September, noted analyst Ming-Chi Kuo issued a note predicting Apple would replace Lightning to facilitate faster data transmission and charging speeds. More recently, code in Apple's iOS 12.1 beta suggests the new iPad Pro will support 4K external displays, a feature that would likely require USB-C. Output at such a high resolution is not supported by any existing iOS device or accessory, including Apple's Lightning-to-HDMI adapter. If true, the change marks the first major shift in iPad connectivity since Apple replaced its 30-pin connector with Lightning on the fourth-generation iPad in 2012. 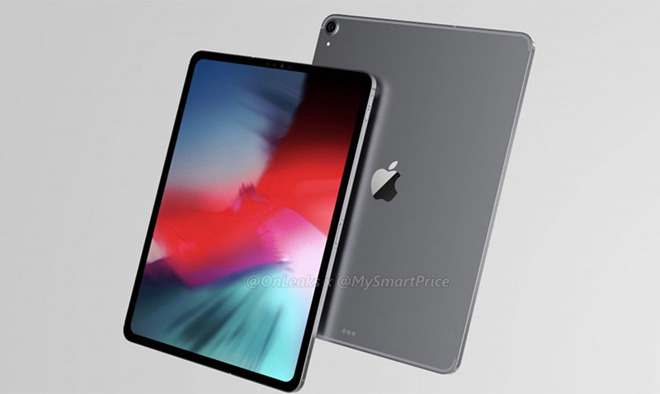 In addition to whispers of USB-C compatibility, one vendor showed Mac Otakara a diagram depicting the dimensions of a supposed next-generation iPad Pro. Sizing was largely similar in scale to supplier information the publication shared in July. Finally, the report claims Apple will concentrate on iPad Pro's creative capabilities when it unveils the new hardware. The company could also take its Apple Business Manager out of beta at the same event, the publication said. Apple is widely expected to release new iPad Pro hardware at a special event on Oct. 30. The next-generation tablets are anticipated to ditch the Touch ID home button in favor of Face ID, granting space for a full-face display.